Recommended to: Readers who love a good mystery, with vivid characters to follow. 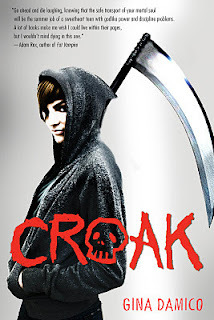 Croak caught my eye early on. Grim reapers. A strong and sarcastic main character. What more could a reader ask for? I was looking for something a little bit different in my reading list, and I thought that this would be just the ticket. As soon as I opened the book and met Lex in the flesh, I knew I was in for a treat! This book drew me in right away, and I happily followed along. First off, I absolutely must talk characters because they are all so fabulous Each one has their own unique personality, and it's impossible not to fall in love with this motley crew. Lex's unflinching sarcasm, Drigg's cocky demeanor, overly optimistic Sofi, they all just shine off the page. I found myself giggling out loud, a lot. I also caught myself reading pages again, just to relive the hilarious banter and altogether random insults that they throw at one another. These are people I'd love to hang out with, and that made reading this book so much more fun. Now that's not to say that the story here isn't good too. The beginning of the story is a little odd, but once Lex finds herself in Croak everything else starts to make sense. Without spoiling I can tell you that Lex finds herself in some pretty interesting situations. One of which involves some fluttery feelings for a boy. Now don't mistake, Lex isn't the shrinking violet type. Far from it. Let's just say that bruises ensue. Anyway, it is really the mystery aspect of the story that steals the show here. Damico drops just enough hints to keep you reading, and to keep the pace flowing really nicely. Even though I figured out the culprit pretty early on, the book was still a great read. That says a lot. The one thing that I was so disappointed about was the ending. After being so caught up in Lex's life, and so enthralled by the mystery surrounding Croak, the ending just felt so flat to me. I'm sure others will love it, and still others will feel no big emotion either way. In my opinion though it was just too convenient and kind of anti-climactic. I know that this is the first in a series though, so I'm hopeful! I'll be back for more.